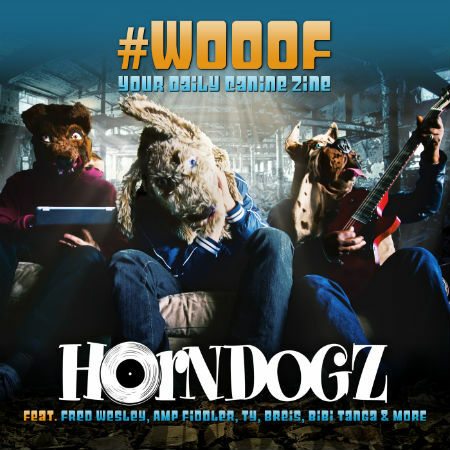 French funk trio HornDogz launch their first album “#Wooof, Your Daily Canine Zine”, a footbridge between Hip Hop and P-Funk feat numerous guest musicians from Fred Wesley to Amp Fiddler. The trio of producers unites 3 crazy dogs you inevitably have heard or encountered alongside Juan Rozoff, Alpha Blondy, Jim Murple, Dele Sosimi, Bibi Tanga or recently with George Clinton, Amp Fiddler & Tony Allen…. If HornDogz is to be considered a horn section in the first place, it is in particular the project of three cornerstones of the French Funk scene. Eric ‘Shrizzadelic’ Rohner, Gilles ‘C-Freak’ Garin & Rico ‘Adiko’ Kerridge first met in the band Malka Family being part of the founding members. After more than 15 years on the road, together or apart, they reunite under the insuperable Greements De Fortune, band of the French TV program Salut Les Terriens. In 2010 they replace at a moment‘s notice the brass section of George Clinton‘s Parliament Funkadelic on his European tour and for this occasion were baptized HornDogz by bassplayer Lige Curry. They adopt this name in order to finalize a project they care so much about: “#WOOOF, Your Daily Canine Zine”. Parallel to their new tour with Amp Fiddler & Tony Allen, the trio shuts itself away in the studio of Uptone Records to compose 14 tracks where they are joined by quality guest musicians yielding their support: Amp Fiddler, Fred Wesley, Blitz the Ambassador, Breis, Bibi Tanga, Greg Boyer, Jee Williams, Juan Rozoff, Lige Curry, Mary Griffin, Michael Clip Payne, Mike Larry & Jude Kidsude, Peeda, Sadiq Bey and Ty. After the release of “Movin’ On” and their EP “Dogfood Vol. 1″ now please meet HornDogz again with their first album “#Wooof” in stores by March 31st 2014 available on CD and digital through Musicast distribution.